Photo of Salt Lake City’s Broadway by Dung Hoang. Then the shopkeeper would assist the customer in finding the most adorable cat sweater. While on the surface this doesn’t appear to be a highly significant part of our culture or society, it is significant. Because not only do we lose the personal interaction with the shopkeeper: a real person who has a great deal of experience and knowledge in the products they are selling, but we are losing out on the experience of walking down an authentic public city street. A street where many individual shopkeepers have invested a huge portion of their lives; who have opened their doors to see how they fare in the public marketplace. The ability for a shopkeeper to realize their individual greatness within the collective community is a major component of what has made America such an innovative economic powerhouse. But the traditional model of small independent shops finding a local customer base and realizing success (outside of any corporate model or franchise) has become a rarity today. The norm today is to conduct most of our shopping inside of big-box complexes or online. This is convenient, but there is something missing in the experience — we no longer feel any connection with the city we inhabit. This disconnectedness leads us to adopt other connections to perhaps radical political ideologies or the belief that our Facebook “community” and “likes” actually matter. We as a species crave community, but online community is a very cheap and arguably unhealthy compromise. City streets and buildings offer a walk through history and the dynamic changing marketplace is fascinating. A vegan donut shop opened beside City Creek Antiques on Broadway. The vegan donut shop was a hit and she moved to her own building on 900 South. The trees on real streets provide an ecosystem for birds and squirrels, together they display the vivid changing seasons. Now the street has a new dynamic –all the people zooming around on the new rentable electric scooters. I recently tried one, and now I realize why these are so popular. They are amazingly fun. Authentic streets offer culture in street performers who test and hone their talent with the passers-by. Authentic streets offer a public rather than private marketplace. I need to use the word “authentic” because there are a few streets in downtown Salt Lake City that appear to be public, but would never allow a street performer nor a protest nor a new local entrepreneur’s idea (such as a vegan donut shop). Several local businesses I spoke to about the LDS-owned City Creek Center said that they were flatly denied from any type of space they might want to lease there. The LDS Church has ceded the authority of the mall rent policies over to Taubman Centers (NYSE: TCO) who are a part of a national mall conglomerate. Their policy is that they won’t rent to risky ventures. They (obviously) prefer to only rent to national chains. 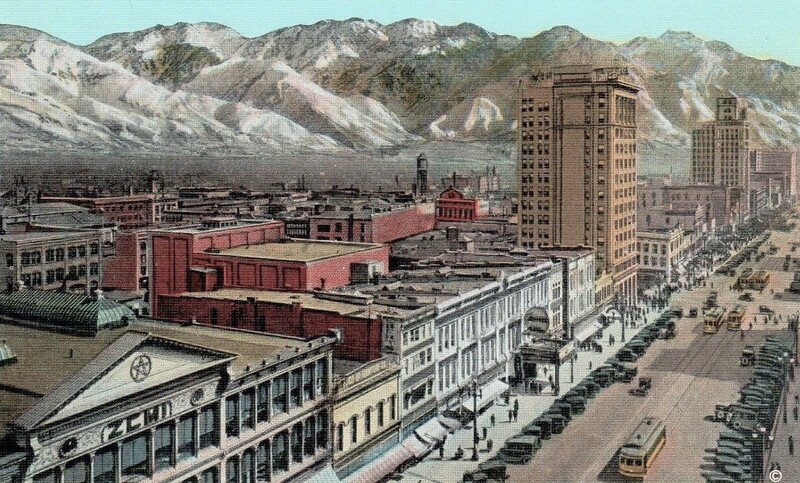 A while ago Utah Stories moved our office from downtown Salt Lake City’s Broadway to Holladay for cheaper rent and better parking. Holladay doesn’t have anything like an authentic city street vibe, it’s mostly strip malls and big developer projects. There is nothing like Broadway in Holladay. But there is nothing like Broadway in all of Utah besides the old Main Streets of every town in Utah. 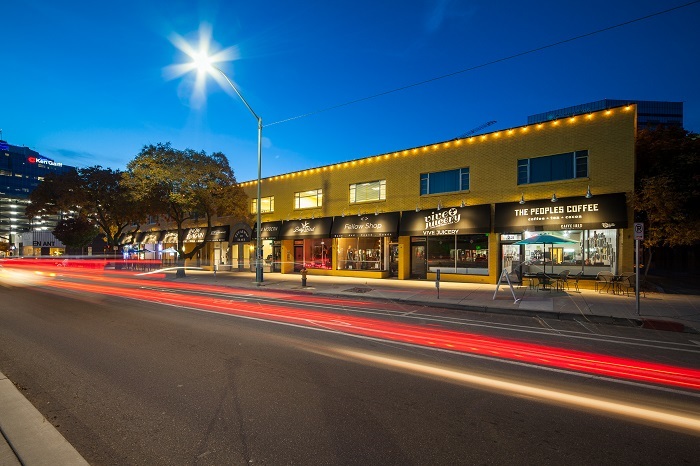 The Broadway shopping district is in peril because Ivory Homes owns a huge chunk of the shopping area, and another investment group owns another big chunk. The tenants in these buildings (who are in the following pages) have informed us that someday soon they will need to vacate. Likely most of the one-story buildings in metro downtown Salt Lake City will be razed to become taller residential towers with mixed-use development. It appears 400 South is leading the way with becoming a major residential corridor. But what Broadway will become remains to be seen. Will the charming shops that have defined the street for the past one-hundred years remain? Or will the street take on an entirely different character? It is a fairly accurate statement: our public marketplace is a reflection of a community’s consumer values. Therefore we shouldn’t gripe about how lame our new communities along the Wasatch Front are shaping up. They are simply a reflection of what the inhabitants want. Draper is 98% chain stores. The individuals who live there must want all these chains. But we found a contradiction. In 2011 the National Board of Realtors conducted a survey to find out what residents wanted in their communities. People were asked if they would prefer a big-box complex style community or a community with authentic city streets, AKA “walkable communities”. Respondents overwhelmingly said they prefer communities that offer authentic streets with a nice mix of local restaurants and local retail. So why are developers and cities only building big-box complexes? Because this model is more economically viable. This model produces a much higher ROI (return on investment). City leaders support this model because it also provides more tax revenue than streets. No study has been conducted to find out if the additional tax revenue gained by cities is negated if they included the cost to residents of prescription anti-depressant medication. Still, this model attracts Wall Street investors because we consumers choose to buy a majority of our products from big-box stores and online rather than from small shops. So the conclusion to this story is obvious. As long as we support the models which produce the highest ROI for city leaders, developers and Wall Street we will need to settle having endless asphalt parking lots, traffic jams and big-box stores, congestion and pollution as our shopping experience rather than the experience described at the top of this story. The simple solution: buy local from small shops, come to downtown Broadway and do some real shopping.